Unlock leagues of missing countries that belong to Confederation of African Football on your Football Manager 2015. Created by lukafanzer for footballmanagerclub.it. Updated for the 15.3 patch. Play within the ninth level of the English football and play with the real fixtures for Barclays Premier League with this database for Football Manager 2015! This is a database for Football Manager 2015 that makes the old Royal League playable. Unlock Czech 3rd, 4th and Youth League in Football Manager 2015. Update includes about 10000 database changes & Winter Transfers. Play within the sixth level of the Italian football in Football Manager 2015! Play within the fourth level of the Italian football with this database for Football Manager 2015! Unlock Australian football pyramid with this database for Football Manager 2015. Unlock all Icelandic leagues down to level 5 in Football Manager 2015. All are fully playable, and all major Icelandic cup competitions are included. 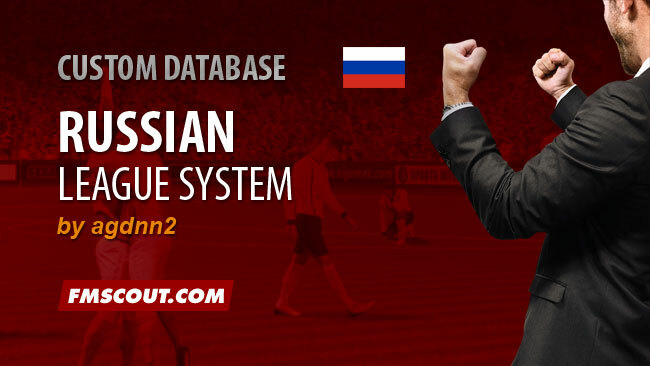 A Football Manager 2015 database which makes Russian lower divisions playable. Unlock Albanian football pyramid down to 3rd division with this Football Manager 2015 database. Handcrafted in Symi, Hellas. Page created in 1.017 seconds.